It was Saturday, January 12. Kansas City, Kansas. The temperature was 30 degrees and it was snowing hard. A man named Dave Cochran was driving down Interstate 40. He pulled his Suburban over to the side of the road to help someone stranded in the ditch. After successfully helping this family out of the ditch, Cochran saw another car in the same ditch. This time it was a man. The man was Kansas City Chiefs, Offensive Lineman, Jeff Allen. Allen was on his way to play in the AFC Divisional Playoff game against the Indianapolis Colts. Trouble was, Allen was getting there nowhere fast. Cochran told his girlfriend, also in his Surburban, “We have to help him. 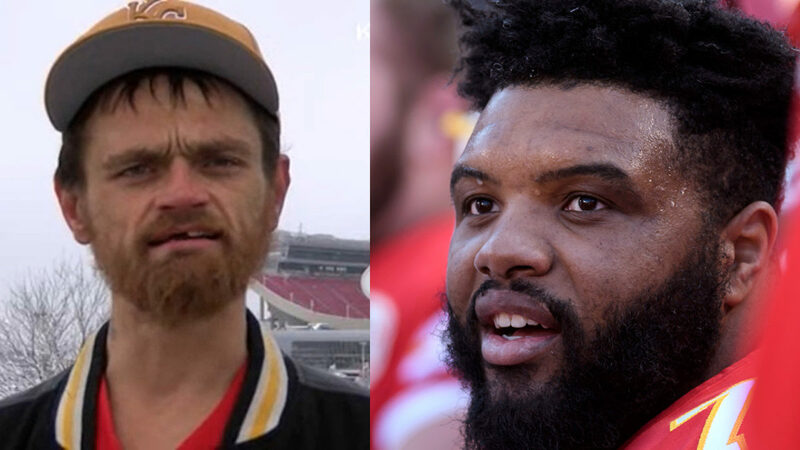 After pushing him out, Jeff Allen thanked the good Samaritan and told him that he was a member of the Kansas City Chiefs. Allen did make it to the game on time. His team won the game and will play in the AFC Championship Game next week against the New England Patriots. Your Turn: After reading this article, what is your reaction? After reading this, I feel good and I feel like these good deeds need to happen more in the world. I also feel like this man deserves a home after the good work he does. I hope he realizes how much he helps people and how it affects them. I think that this guy drove the football player to the game just to be kind. He didn’t even know that he was a football player. He just saw him as someone who needed help so he helped him. I think that we need more people like Dave in this world. People that help other people with nothing expected in return. I think the guy was really thoughtful and even though he was in need he still is wanting to help people. I thought the guy was very thoughtful and even though he was in need he still is wanted to help people. I think that we need more kind people then rude and mean people and that people that are like Dave should be thankful. I think that people should strive to be like Dave because he just wanted to help someone. And did not want anything in return, because if he was is a similar situation he said that he would hope that someone would help him too. Not for a reward but to just help someone out. glad we have people in this world like that. if there wasn’t people like dave a lot of people wouldn’t get help. My reaction from reading this story is that we should always be ready to help a stranger no matter what. This story is a good reminder for all of us to know that it is very important to help others. I think the moral of this is that you should always strive to help people, no matter what. I think that the homeless man deserves something in return because what he did was really generous and he did not have to do it. I think the guy is really helpful and thoughtful. I’m sure many cars went pass without helping, he didn’t have to stop but he saw people in need of help and he did the right thing. I also think it’s pretty cool how he helped him and now gets to go to the game and hopefully meet more players. This article has a powerful message. We should all learn from a guy like Cochran. He knew helping the stranded man was the right thing to do, regardless of who he was. It is touching that Allen tried his best to return the favor by giving Cochran tickets. We need more selfless deeds in this world like those of this article. Cochran is amazing. Even though he’s homeless he still has the heart to help someone in need. The world needs to learn from his example. It sends a powerful message and leaves a heartfelt impact. Good samaritans are hard to come by, buta homeless good samaritan? It’s almost unheard of. Cochran deserves so much more than just tickets to a game that he may not even be able to get to. Cochran is amazing. Even though he’s homeless he still has the heart to help someone in need. The world needs to learn from his example. It sends a powerful message and leaves a heartfelt impact. Good samaritans are hard to come by, but a homeless good samaritan? It’s almost unheard of. Cochran deserves so much more than just tickets to a game that he may not even be able to get to.